Before marriage my husband and I took many vacations together. We met up at fun cities in Europe and America. After we got married our travels took us even further and we toured Hong Kong, Bangkok and even Austrailia. I look back at all our travels with fondness. Since we had the two little ones our travel has been limited. As you all know traveling with little ones is not only expensive as thats two more flights to pay for but also packing for kids is not fun. Often for our weekend trips to the beach or Grandmas we fill our trunk completely and so packing for a flight where baggage is often an extra charge this sure can add to the trip expense. Now that our 7 and 5 year old are mobile and independent we're starting to think about trips again. I'd love to take the children to a place where we've visited so that we could share our experience. For now, just a trip away to the beach or to a state we've never been to would be great. For Mother's day wouldn't it be great to receive luggage with a promise for a family trip? I was offered the opportunity to review an ebag product in the “Mom’s the Word” Gift Guide, items for moms by moms brought you by Bags by eBags. I chose the wheeled laptop convertible below. 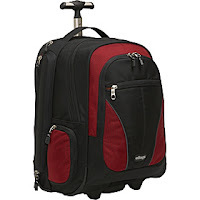 This is a great pick for a trip for my needs because it can be used as a carry-on and can hold my laptop for my blogging needs while big enough to hold the kids art supplies to keep them busy on trips. Plus the wheels mean I can load it up as much as I want. I love the stylish mono-pole handle system and the wide base that means it doesn't tip easily. The luggage is convertible though so if you need you can use it as a backpack too. I love luggage that has compartments and this bag offers secret compartments that I can stash the kids candy. Whether you are a Mom who needs luggage for a getaway or a family vacation there's choices galore at ebags. The price for the wheeled laptop convertible on ebags.com is only $101.99+ free shipping! Disclosure: I received a complimentary sample in exchange for my honest opinion. All opinions are of my own, others may vary.